Having survived the near-coma induced by 17 hours of travel and a nine-hour time difference, our first full day in Madrid called for on-foot orientation. As every road trip requires fuel, we descended to the lobby of our hotel in search of fresh fruit to counter the unfortunate but unavoidable transgressions committed en route. The hotel restaurant, Midnight Rose, features a sleek dining room abutted by a swank tapas lounge. (More on that later in the trip.) Confronted with the choice of breakfast menu or buffet, we chose the latter — half-price if you join the hotel chain’s loyalty club — and started the day with fresh orange juice, coffee, sliced citrus, pineapple, eggs, pork in various mouthwatering forms and the like. My favorite: a table devoted to assorted cheeses, lox, cherry tomatoes, salchicha and jamón ibérico. Delightful. Thus fortified and dressed for whatever weather might develop, we ventured west through narrow cobbled streets toward historic Plaza Mayor, which presented the first of many statues whose subjects were either 1. Master astride mount or 2. Steed en solo, having ditched master. The statuary of Madrid has a decidedly horsey flavor. Restaurants surround Mayor, not surprising given the plaza’s tourist population even at 9 a.m. rivals the number of bronze caballeros in the city. 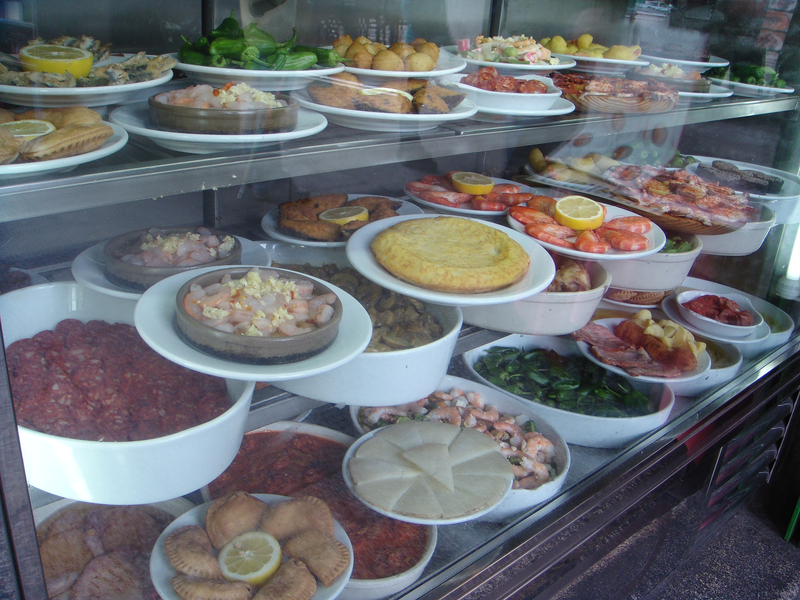 What did surprise was the freshness of the shrimp, octopus, sausage, peppers, croquettes and other enticements artfully arranged in taberna windows. It was all we could do not to re-indulge. But no — onward to visitor-crammed el Palacio Real, through the royally trim Jardines de Sabatini, up to the Plaza de Espana, along the perimeter of Parque de la Montana and through the tranquil rose garden there, up the hill to Plaza de la Moncloa, back along the Gran Via toward Puerta del Sol and our home square, Plaza de Santa Ana. We walked for four or five hours, and though clouds threatened, not a drop christened us. Ravenous now, we explored Santa Ana in search of a bite. Last evening, in our sleep-deprived haze, we bumbled into the modern Vinoteca Barbechera for croquettas, gambas y tortilla before succumbing to weariness. Today, we opted for Cerverzería Aleman’s terraza seating (outdoor, on the square) where we enjoyed a basic but welcome ensalada mixto, delectable aceitunas (olives), a crusty bocadillo de jamón ibérico y queso manchego (ham and cheese on baguette) and patatas fritas (addictive potato chips served at every taberna). Beer and wine in hand, we were set to linger — but alas the sky darkened and finally discharged. Relatively warm and dry beneath our terrace umbrella, we ate, drank and heartily sympathized with the luckless souls around us as they ducked, scrambled, scattered and otherwise fled the deluge. Many were unsuccessful, but most accepted the drenching with good humor, including our waiter, who warmed up to us as the temperature fell. “I am sorry so much,” he said. “This crazy weather.” We paid our tab and headed up for a siesta. At 11-ish, our appetites spurred us out into the night with the rest of Madrid and its tourist onslaught. Holy week or is this typical? The cervecerías ringing Santa Ana overflowed, so we cut up a side street and happened on Guru, a quiet Indian restaurant with an open table. We started with a prawn flatbread called a puree and buttery vegetable pakura accompanied by a spicy-salty chile paste, a creamy mint sauce and sliced onions. Sizzling chicken tikka and a mild, savory aloo gobi rounded out our modest midnight meal and sent us home satisfied if not raving. We’ll happily try this place again, but for now it’s back to the pork — and whatever else awaits. I was hoping you’d write while you were in Madrid! Sound like a fantastic day-croquettas, ham and cheese on a baguette, chips and beer sounds right up my alley. relax, drink, eat and enjoy! Wonderful! Thanks for update. I loved the Guru menu that you included. Here’s to Madrid and more news of your adventures.